School of Business, University of São Paulo, Ribeirão Preto, Brazil. Received September 2nd, 2010; revised October 16th, 2010; accepted November 18th, 2010.
to or even better than those hitherto proposed, in terms of inter-cell moves and dimensions of the cells. different cells projected is sought. colors for which a k-coloring of G exists. edges is at least 2-chromatic. [parts × parts] is obtained. in a number identical to the allocated number of cells. the family that most needs its work. operation k on a part[i]. In the computational tests, a = 1, b = 0, c = -1.
family that executes the highest number of operations. minimum diameter are enumerated only at the last stage. termined. 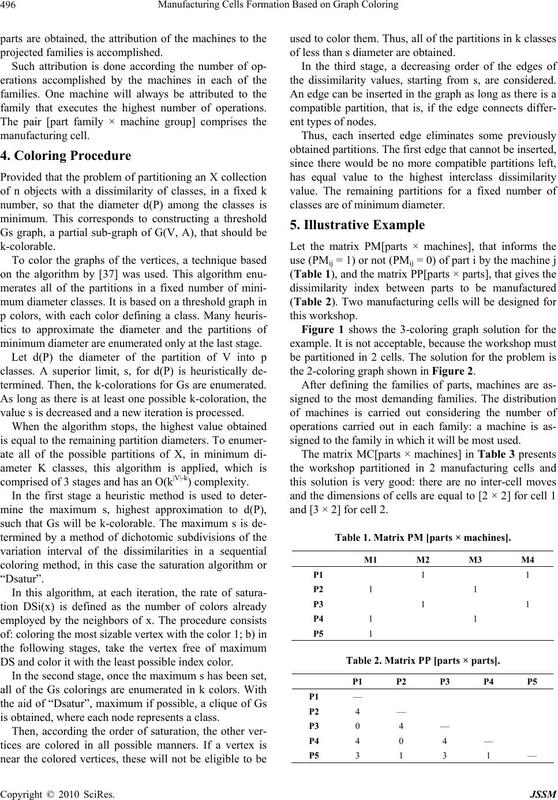 Then, the k-colorations for Gs are enumerated. value s is decreased and a new iteration is processed. comprised of 3 stages and has an O(k|V|-k) complexity. DS and color it with the least possible index color. is obtained, where each node represents a class. of less than s diameter are obtained. the dissimilarity values, starting from s, are considered. classes are of minimum diameter. the 2-coloring graph shown in Figure 2.
signed to the family in which it will be most used. and [3 × 2] for cell 2. Table 1. Matrix PM [parts × machines]. Table 2. Matrix PP [parts × parts]. Table 3. Matrix MC [parts × machines]. and the dimensions of the cells (D). tically the same up to what is currently known. surements were done in a Pentium 2.20 GHz, 1.99 GB. grams and separate the parts with different programs. Table 5. Manufacturing cells (I = 2). Table 6. Manufacturing cells (I = 0). Gestão e Produção, Vol. 9, No. 1, 2002, pp. 62-77.
search, Vol. 27, No. 8, 1989, pp. 1287-1304.
the presented method for the workshop proposed by . duction Research, Vol. 28, No. 9, 1990, pp. 1695-1711.
cept,” International Journal of Production Research, Vol. 25, No. 4, 1987, pp. 561-569. Research, Vol. 69, No. 3, 1993, pp. 284-291.
duction Research, Vol. 29, No. 2, 1991, pp. 343-356.
search, Vol. 34, No. 4, 1996, pp. 1045-1063. Vol. 77, No. 1, 1998, pp. 79-95. Manufacturing, Vol. 21, No. 3, 2005, pp. 273-288. 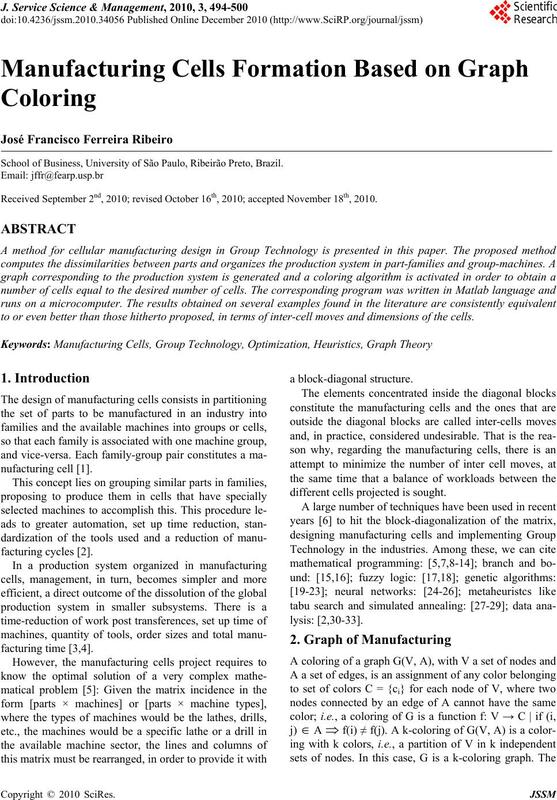 Journal of Production Research, Vol. 33, No. 2, 1995, pp. 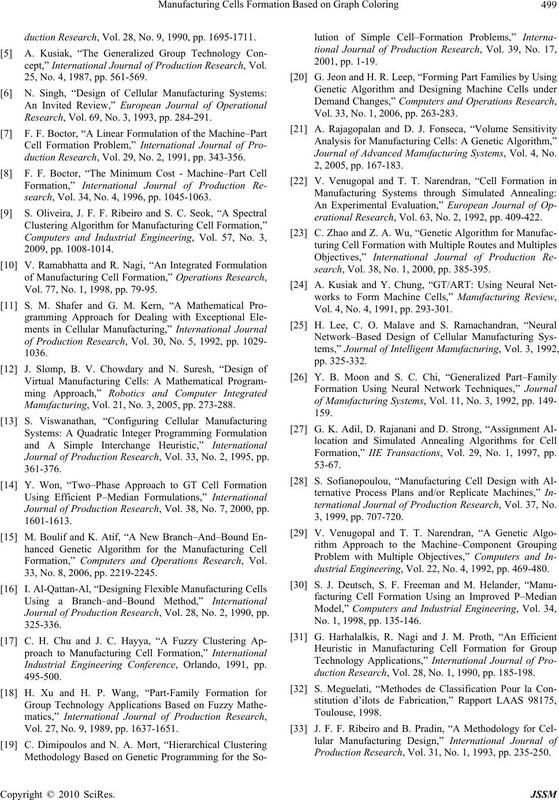 Journal of Production Research, Vol. 38, No. 7, 2000, pp. 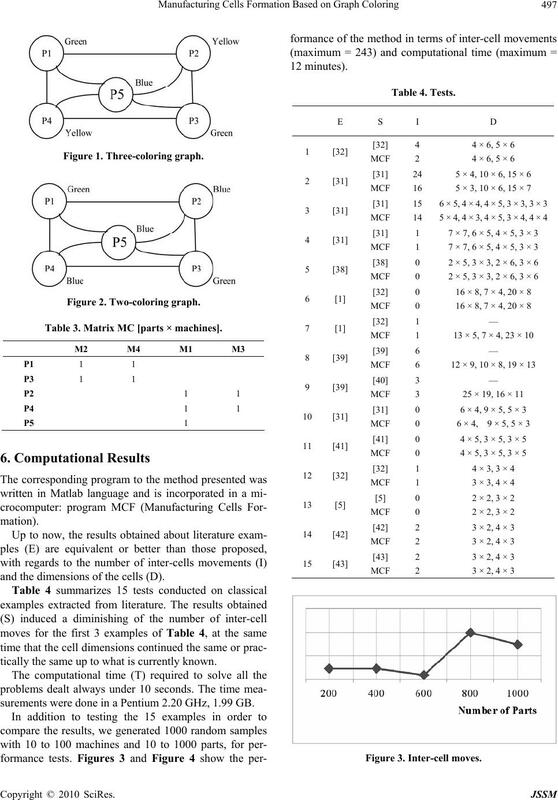 Formation,” Computers and Operations Research, Vol. 33, No. 8, 2006, pp. 2219-2245. 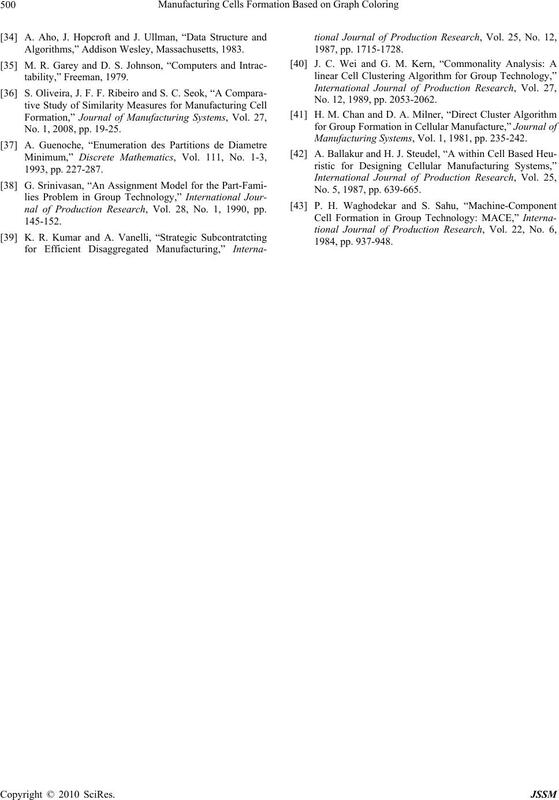 Journal of Production Research, Vol. 28, No. 2, 1990, pp. Industrial Engineering Conference, Orlando, 1991, pp. Vol. 27, No. 9, 1989, pp. 1637-1651. Vol. 33, No. 1, 2006, pp. 263-283. 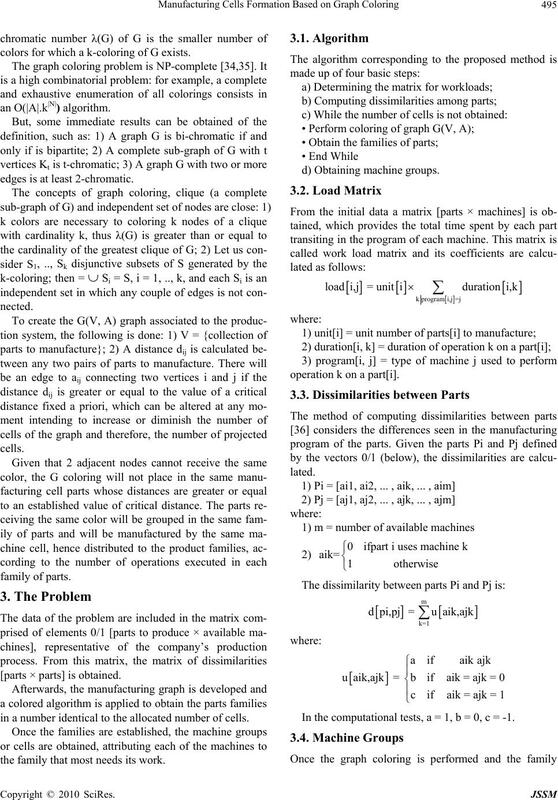 Journal of Advanced Manufacturing Systems, Vol. 4, No. erational Research, Vol. 63, No. 2, 1992, pp. 409-422.
search, Vol. 38, No. 1, 2000, pp. 385-395. Vol. 4, No. 4, 1991, pp. 293-301. Formation,” IIE Transactions, Vol. 29, No. 1, 1997, pp. ternational Journal of Production Research, Vol. 37, No. dustrial Engineering, Vol. 22, No. 4, 1992, pp. 469-480. No. 1, 1998, pp. 135-146.
duction Research, Vol. 28, No. 1, 1990, pp. 185-198. Production Research, Vol. 31, No. 1, 1993, pp. 235-250. Algorithms,” Addison Wesley, Massachusetts, 1983. No. 1, 2008, pp. 19-25.
nal of Production Research, Vol. 28, No. 1, 1990, pp. No. 12, 1989, pp. 2053-2062. 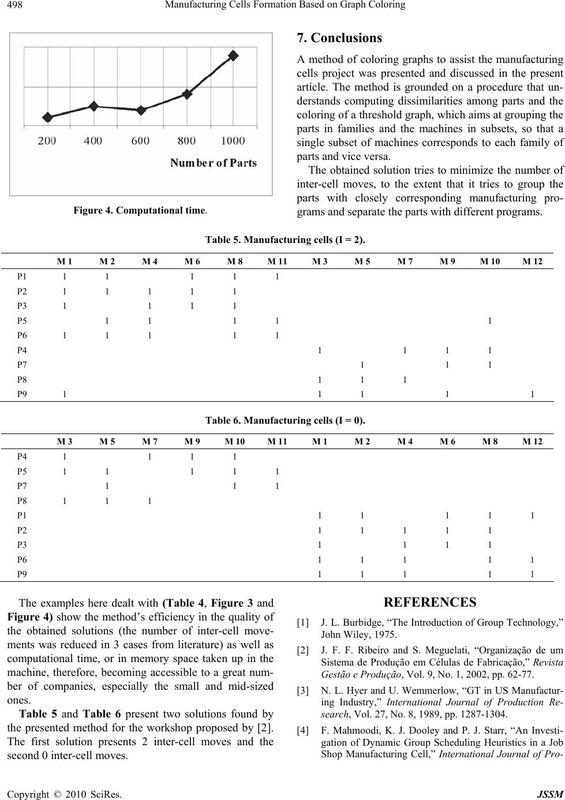 Manufacturing Systems, Vol. 1, 1981, pp. 235-242. No. 5, 1987, pp. 639-665.